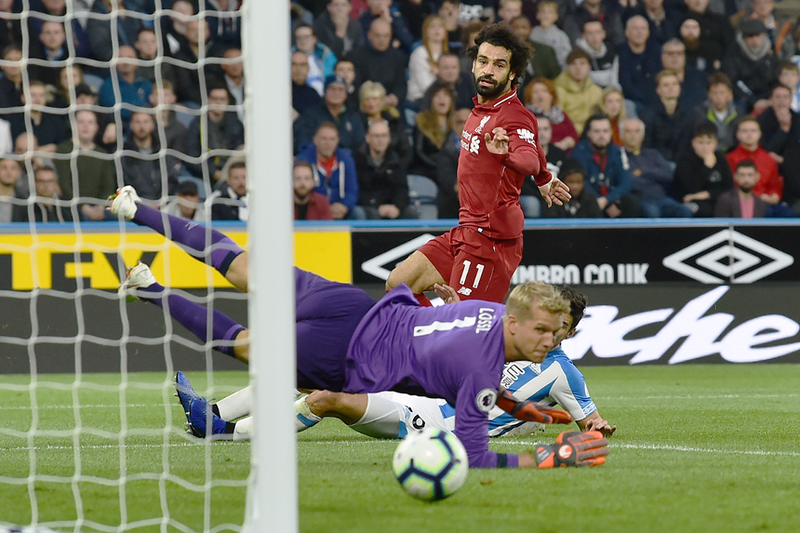 A first Premier League goal in four weeks from Mohamed Salah allowed Liverpool to edge past Huddersfield Town 1-0 to stay level on points with Manchester City at the top of the Premier League. On 24 minutes, a superb Joe Gomez pass found Xherdan Shaqiri. His through-ball to Salah was finished off first-time past Jonas Lossl and in off the far post for the Egyptian's fourth goal of the season. Huddersfield pressed for an equaliser and almost had one when Jonathan Hogg struck a post from long range. Laurent Depoitre had a second-half header well saved by Alisson, while Steve Mounie put a good chance over from close range as Liverpool held on for the win. Victory moves the Reds to 23 points, behind leaders City on goal difference. Huddersfield drop to 19th on three points.